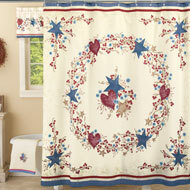 Winter Solitude Cardinal Shower Curtain from Collections Etc. 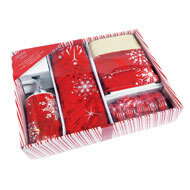 $29.99 $26.99 Save up to 10% Now! This lovely cardinal couple atop a pine branch is the perfect way to add seasonal style to your bath. 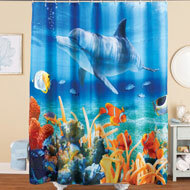 The peaceful scene has a soft blue background and openings along the top for your hooks (not incl.). Machine wash. Polyester; imported. 72"Sq. 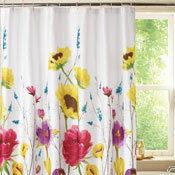 The colorful design of this shower curtain brings a fresh, springtime garden feel to your bathroom. The white background features vibrant wild flowers and plenty of style. Shower rings not included. Machine wash. Polyester. 72" x 70".